Yom Kippur is officially over and I am just too tired to blog at this moment. Instead, I am off to "read" a book while knitting more cloths mindlessly. Here is my cloth collection that I have made right now. 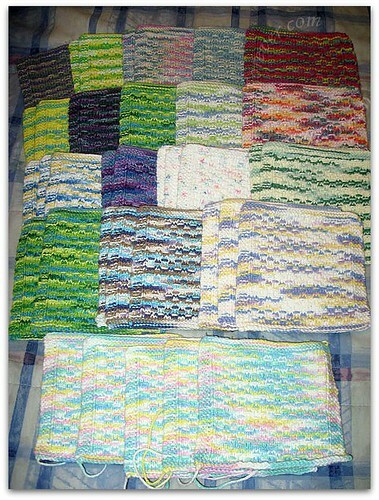 Earlier in the week, JSL helped me to take out my wash cloth collection that I have been making this summer. There are 31 completely finished, 5 more that need final touches and another one on my needles right now. Slowly getting enough for gift giving and then, once the weather is coole,r I will move back to working on my big blanket. The boys were jealous of the super soft blanket that I made Cousin BA. Here is the little guy in it back in March before his bris. 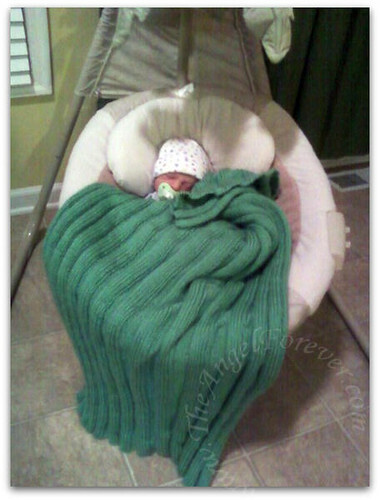 Soon after he was born, I started making them one, but have been on hiatus thanks to the warmer summer months. Now that the fall is nearly here, it will be time to get cracking on the big stripped, soft blanket that is currently waiting for me on my circular needles. For now, I am working on more cloths that can almost be done with my eyes closed. He is adorable!!! Love your crafts; You are very talented! Thank you for the visit so I could find your sweet blog! I’m off to read & see more. Hope you’re having a wonderful weekend! You are awesomely crafty! What a sweet baby. (I think we have the same swing. Er… had. My baby is 14 months old now.) I look forward to seeing your blanket creation!